New Socks. Two Socks. Whose Socks? Here's an easy game to play. Here's an easy thing to say.... New socks. Two socks. Whose socks? Sue's socks. 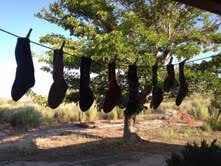 Who sews whose socks? Sue sews Sue's socks. Who sees who sew whose new socks, sir? You see Sue sew Sue's new socks, sir. That's not easy, Mr. Fox, sir. It's been a while since I've shared some hand knit socks with you. When I assembled the ones I've been making lately while it was too hot to do anything else, I thought of Dr. Seuss and his tongue twisty book, Fox in Socks. Here are the socks that have been flying off the needles lately. 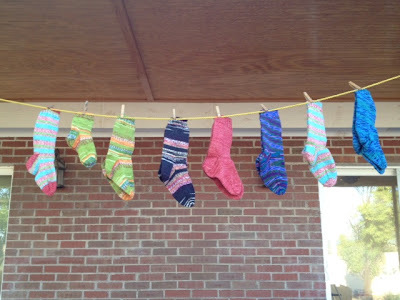 Lucky for me, my sister and my youngest granddaughter are fans of brightly colored wool socks, too, because otherwise it would be hard to find room in my own sock drawer for all the pairs I've been making. The next challenge will be to combine all the bits of yarn I have left over to make some ultra-colorful socks. Stay tuned. What a summer it has been! Since returning from our travels to France, Iceland, New York, New Hampshire, and California we've been kicking back and lazily enduring the desert summer heat here in southern New Mexico. Our time in France is starting to feel like a dream, so I'd better start writing about some of the wonderful memories before they drift away completely. We flew to Paris at the end of May, picked up our rental car and headed south, jet-lagged as we were. Don't you wish you had been there with us? Three worn out and cranky travelers, snappy tempers, unfamiliar car, busy Paris highways, unfamiliar road signs... We might have given up, were it not for the crisp, no-nonsense British woman's voice issuing forth from under the Peugeot's navigation screen. She led us down through the zippy roads leading to the A-10, south through the beautiful Loire Valley, then into a maze of rural roads and roundabouts, until we were on what seemed like donkey tracks leading through field after field of wheat and red poppies. 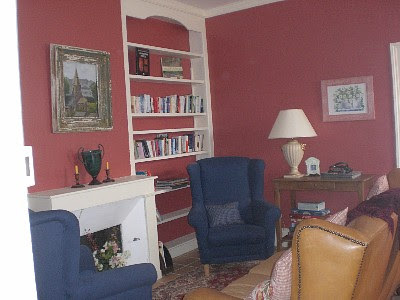 Where in the heck was this place we had rented via the Internet? 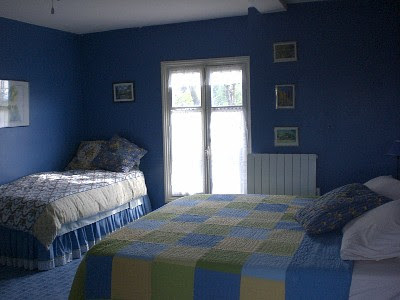 Here is was, at last: Les Volets Bleus (Blue Shutters) in the commune of Monts-sur-Guesnes ("settled for many centuries"). We loved the house at first sight. 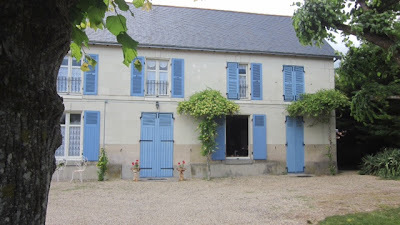 It was tucked back from the quiet road, its front yard fragrant with lime trees, herbs, roses, and honeysuckle. The shutters provided French-style natural air conditioning. There seemed to be no mosquitoes, but a bird flew in one morning, took a turn around the room while tweeting its approval, then flew out again. 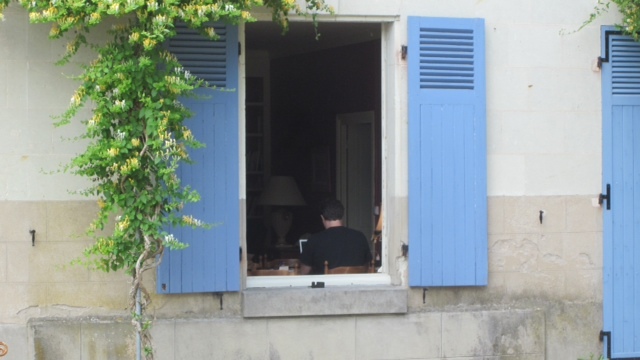 That's my son inside, setting up dinner reservations via the wireless internet access. 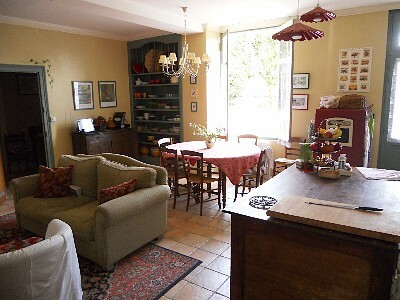 The front door brought us into this marvelous great room/kitchen, which was outfitted with everything we needed. I loved the dishes and casseroles, especially the rabbit one. The other side of the great room contained spaces for people to visit around the fireplace, and that large round table where we could look out through the honeysuckle vines while sipping local wine. 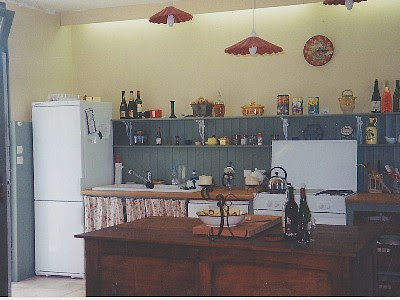 If you click to enlarge this photo, you might be able to make out the rabbit casserole over on the shelf in the corner. 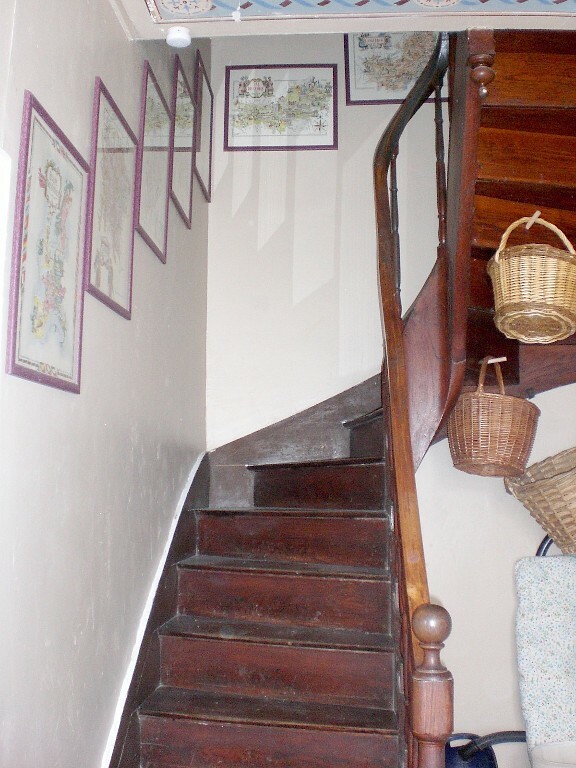 This charming staircase led upstairs to many bedrooms with sleeping accommodations for ten or so. This is the bedroom that Beez and I chose to stay in. That was one comfy bed with a luxurious duvet and feather pillows. Throughout the house I admired the curtains and bed linens and slipcovers, all done by an expert with a wonderful sense of color and style. 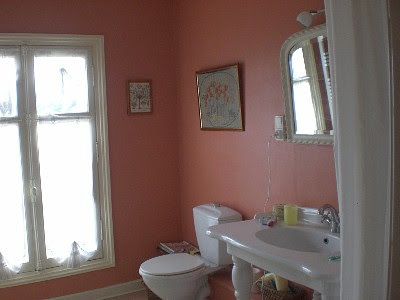 This was upstairs "the bathroom with a view." Those big windows were always open during the cool parts of the day and overlooked the fragrant lime trees (no relation to citrus trees--we call them linden trees in North America), whose perfume is said to exert a calming influence. Downstairs was another bathroom with a claw-foot bathtub. As a matter of fact, you could do just that. The place is for sale now, since the owners would like to be done with their long-distance property management (they live in California, Massachusetts, and New Mexico). 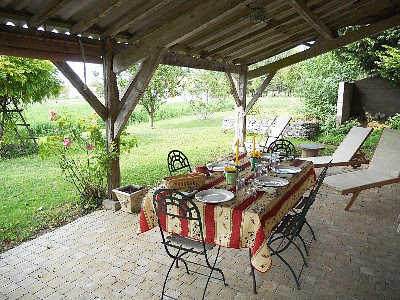 Perhaps you would like to buy the place and rent it out to us for a couple of weeks next summer--it comes completely furnished. I'll bet those wonderful dishes are included, as well. Details regarding the sale of the property are here.